The year in Scottish football delivered a typical mixture of glory, intrigue, and dramatic upheavals. There was a continuing sense of the game trying to rediscover its self-assurance and identity, a theme that will carry into the new year amidst a growing enthusiasm for discussing league restructuring. 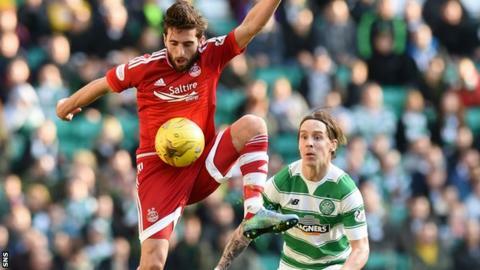 Some events felt destined to occur, since for all that Aberdeen raised their level and their consistency, nobody was surprised to see Celtic pull away with a confident surge last season. The past 12 months have not answered all of the game's questions, but delivered enough talking points to sustain the endless, sometimes rancorous, always heartfelt passions of Scottish football supporters. The year began with Celtic gathering momentum. As Ronny Deila set upon his strongest starting XI, his team found its authority. Celtic started 2015 with eight straight victories in all competitions, including a 2-0 win over Rangers in the Scottish League Cup semi-final. That was not a defining victory - the game barely carried the competitive edge or tense rivalry of typical Old Firm encounters - but a 4-0 win over Aberdeen in March confirmed that Celtic possessed the nerve and the capability to retain the title. Impressive displays against Internazionale in the Europa League also suggested the team was maturing, and only an extra-time defeat by Inverness Caledonian Thistle in the Scottish Cup semi-final, when a handball decision went against Deila's side, halted Celtic's hopes of a treble. The summer waylaid the club, though, and the manager has yet to adapt fully to those circumstances. The two outstanding central defenders in Scotland last season, Virgil van Dijk and Jason Denayer, left Celtic during the summer transfer window. The recruitment strategy continues to focus on signing young players of potential and value, but the defence has been fragile and European ties have exposed a lack of adaptation. The consequence was damaging losses to Malmo and Molde. Questions gather around Deila. While signing the best young players of rival clubs is a sound policy, it leaves the team vulnerable to growing pains. The cup competitions were a tale of two sides who encountered Celtic. Back-to-back meetings with the champions in the league, the League Cup final and the Scottish Cup seemed to demoralise Dundee United. They lost in all three competitions. The sale of Stuart Armstrong and Gary Mackay-Steven to Celtic in the final hours of the transfer window contributed to the sense of United being in decline, and despite winning their first game after the window closed, they failed to win any of their next 10. By the end of the season, United had won only three of their final 18 fixtures, and the new campaign brought little relief. In September, Jackie McNamara was sacked and replaced by Mixu Paatelainen, but United end the year bottom of the Premiership; they began it sitting third, only three points behind the leaders Aberdeen. Inverness Caledonian Thistle represent another contrast, since they saw off Celtic in the Scottish Cup semi-final and then followed that up with a thrilling win over Falkirk in the final to land the club's first major trophy. John Hughes was coveted by Dundee United but has since signed a new contract, while Inverness posted a profit. Results have slipped, but the club outperformed in finishing third last season and remain full of vigour. Hope intruded into the lives of Scotland fans when Gordon Strachan brought optimism back to the national team. For a spell, it looked as though qualifying for Euro 2016 was in reach, but old failings were lurking in wait. At the critical point, the team's accomplishment slipped. A loss to Georgia unhinged Scotland, and they finished fourth in Group D behind Republic of Ireland, who then qualified through the play-offs. The women's national team is well-placed in the Euro 2017 qualifying campaign, while Glasgow City Ladies continued to be trailblazers, meeting Paris St Germain in the Champions League quarter-final in March, the first Scottish side to reach that stage of the competition. They ended up losing 7-0 on aggregate, but they are proving themselves, again, to be a club on a sustained run of progress. An air of stability eventually settled over Ibrox when the club's board was unseated by a group of investors including Dave King and Douglas Park in March. There are still financial challenges, with the club losing money while it remains in the Championship and locked into a retail agreement with Sports Direct that delivers lower commercial incomes than the club has historically received. Even so, the appointment of Mark Warburton as manager brought a freshness and vibrancy following the setback of losing to Motherwell in the Premiership play-off final last season. Rangers have looked better and more certain, but they cannot shake off the resurgence of Hibernian. Alan Stubbs' side was the form team of the first six months of the year in the Championship and has matched that run this term to bring a thrilling life to the title race. Hearts could not be overcome after establishing their dominance at the top of the Championship last term, and their return to the top flight in the summer has delivered another season of progress as Robbie Neilson and Craig Levein continue to work on the club's revival.